The great thing about collecting old road maps is that they don't take up a huge amount of space, unlike collecting old cars themselves! The early maps and atlases often feature very attractive artwork on their covers, or are designed very much in the style of the day. On this page I've scanned and put up some map and atlas covers that I've got in my own collection, the earliest being a Bacon's County Map and Guide for Yorkshire that has a pair of Victorian cyclists on the cover, right through to the 1950s and 1960s with maps from both motor manufacturers, and several oil / fuel companies. 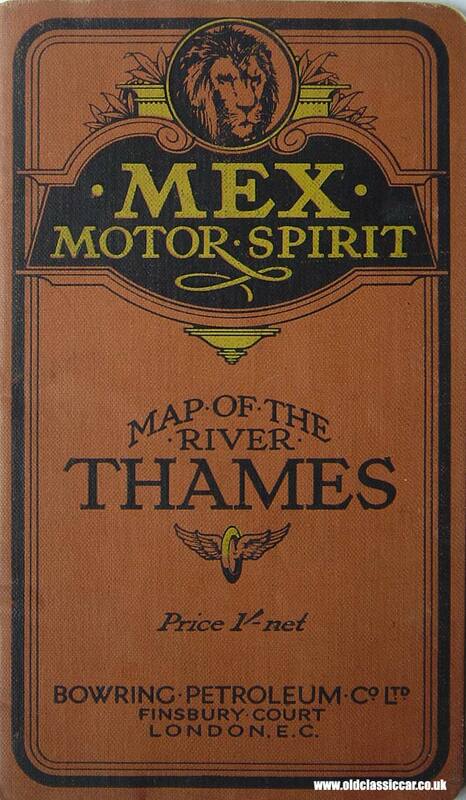 Different organisations issued their own maps - on this page are examples of map distributed by Ordnance Survey, Gulf Oil, Michelin Tyres, British Motor Corporation (BMC) and MEX Motor Spirit, to name just a few. I've also included a couple of tour guides. You can click on any of the thumbnail images below, to see a larger version. County Road Map and Gazetteer. BMC sold these maps, for a mighty 3'6, in the late 1950s and 1960s, with each map relating to a particular county, in this case Sussex in Southern England. The roadmap is in fact just a fold out section in the back, the bulk of the content is local attractions and BMC authorised service depots. Oversiktskart over Automobilveier I Sor-Norge. As far as I can tell this old map, from 1947, covers the southern regions of Norway. It also suggests that it was printed for a motoring club or organisation - "utarbeidet for kongelig Norsk Automobilklub". On the rear, and shown here (more interesting than the cover) is this great advert for Mobiloil oils and the Norsk Vacuum Oil Company. 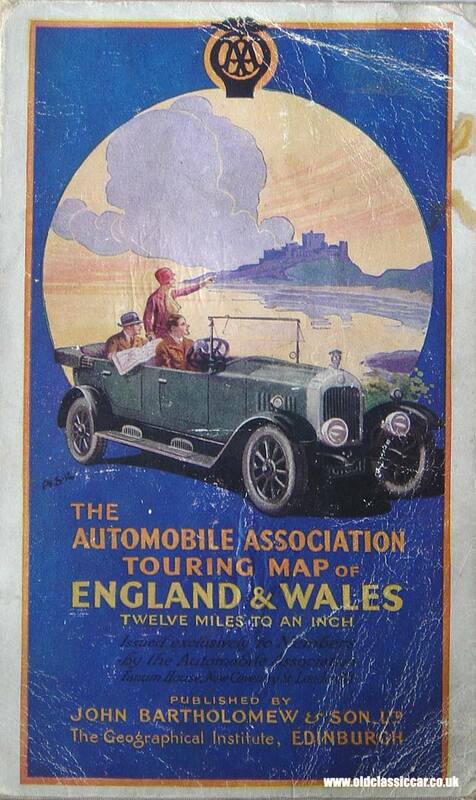 The Automobile Association Touring Map of England and Wales. I'd estimate this wonderful old map, printed on paper and mounted on linen, dates to the 1920s, judging by the handsome tourer on the well illustrated cover. It was issued exclusively to members by the Automobile Association, and published by John Bartholomew & Son Ltd. MEX Motor Spirit. This map of the River Thames, which cost all of 1 shilling (5p), is in book format rather than a fold-out publication. It was issued by the Bowring Petroleum Co. Ltd. of Finsbury Court, London. Again I suspect this dates to the 1920s or 1930s. The map pages are in full colour. Also there is a history of Mex Motor Spirit, and illustrations (both inside and on the back cover) of the Mex 2 gallon petrol tin with patent "Open Easy" Faucet, or cap to you and me. Bacon's County Map and Guide. This ancient map may well be from the Victorian era, and covers Yorkshire .. 'with parts of adjoining counties'. 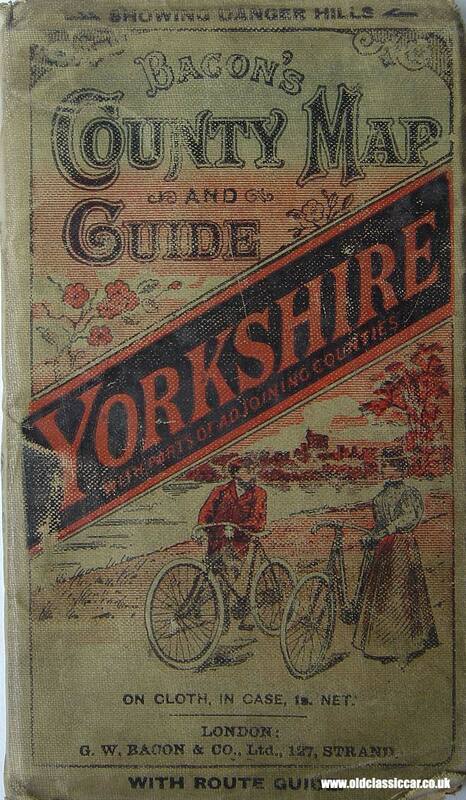 It is in 2 sections, a printed paper part with a guide to Yorkshire, and details of cycling maps that could be purchased. The 2nd part is a fold out map of the area, 'showing danger hills', whatever they are. Ordnance Survey Road Map of Great Britain. 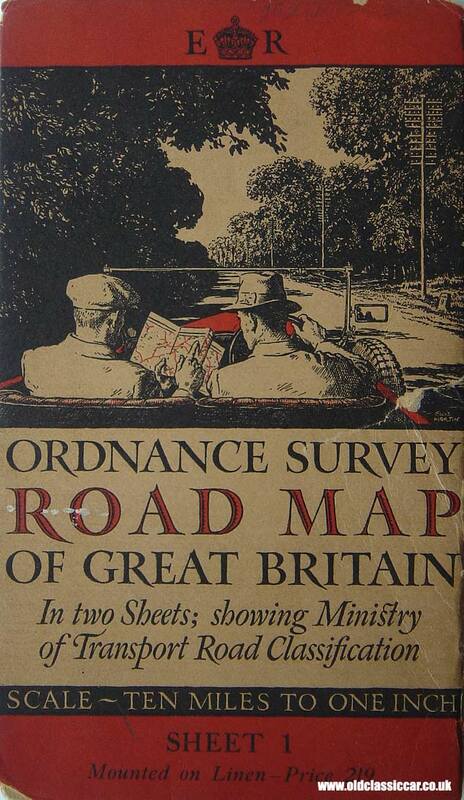 Another 1930s map by the look of it, issued by Ordnance Survey (OS). It advises that this map was first printed in 1932, and is updated periodically as roads change. 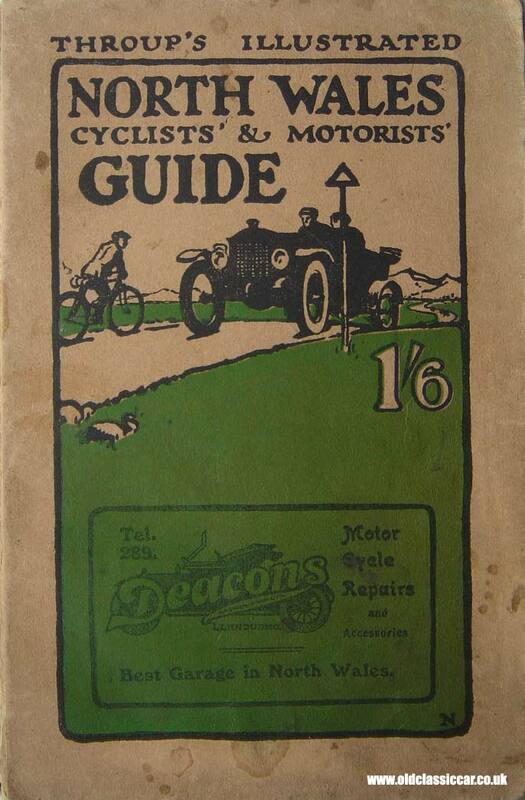 The cover shows two gents pondering which route to take in their open tourer. Nice to see appropriate headgear being worn too. Throup's Illustrated North Wales Cyclists' & Motorists' Guide. Costing 1'6 this handy little book is in fact a guide rather than a map, but I like the artwork so included it here. It is packed with great adverts for hotels, motor engineers (eg J. Richardson & Son of Altrincham - Arrol-Johnston agents), and so on. Char-a-banc trips could also be booked at the Penmaenmawr Motor Co. Ltd. Again probably from the 1920s judging by the advertisements. 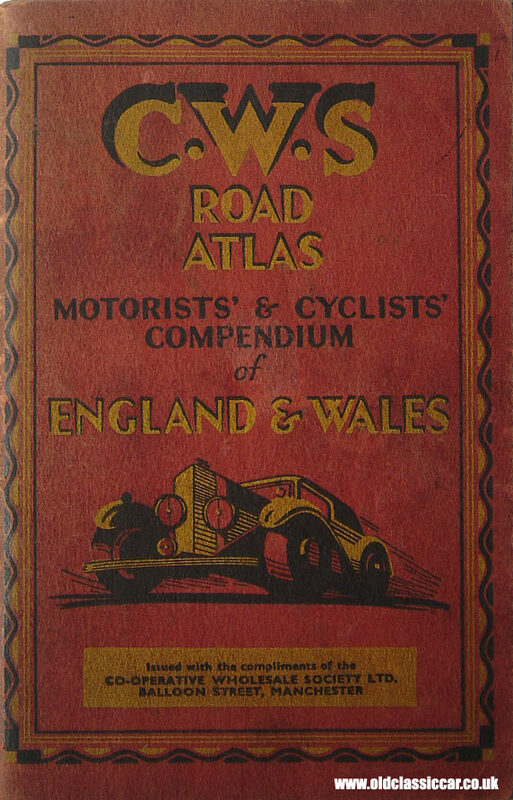 CWS Road Atlas - Motorists' & Cyclists' Compendium of England & Wales. Issued with the compliments of the Co-Operative Wholesale Society Ltd. Colour maps feature as do some great drawings of old road signs, Belisha beacons and Automatic Traffic Signals. Over to the USA for this one, a map of Cleveland issued by Sinclair Oils some time in the early 1960s I'd guess. The cover shows a rakish sedan pulled up outside a service station, with attendants seeing to the grubby windshield, filling the gas tank, and checking the tire pressures. Gulf Tourgide Map. Another colourful US map from the 1960s, or 1969 to be exact. Covers New Hampshire, Vermont and Massachusetts, Connecticut and Rhode Island. Is Tourgide how the Americans spell Tourguide, or is it just a trendy word used by Gulf to catch the eye? Michelin Map of the British Isles. Nice to see the original Mr Bibendum, puffing away on a huge cigar - no political correctness rubbish in those days. I think this is from the 20s, on the rear is a great advert showing Bibendum holding a huge wheel aloft with a Michelin Cable tyre fitted to it - 'the best detachable wheel - the Michelin Wheel'. Did they produce wheels too in those days? A nice touch is cartoons of Bibendum in various swimming poses out in the North Sea. 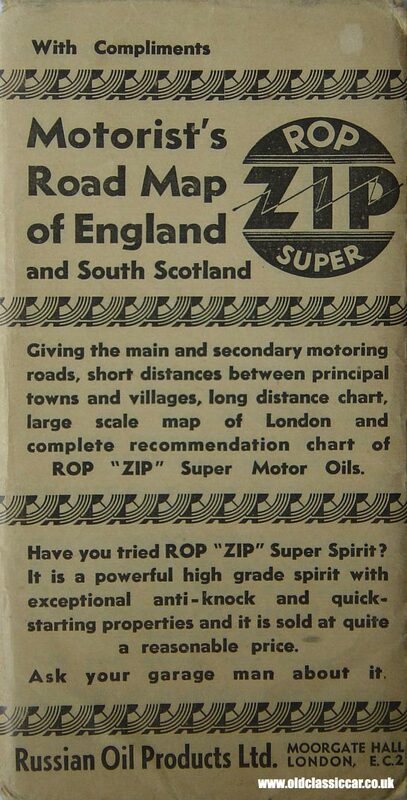 ROP Super Motorists' Road Map of England and South Scotland. This old map is still in its original envelope (see the scan) and is in amazing condition. Russian Oil Products (ROP) was one of many companies supplying motor spirit and oils in the 1920s. ROP Zip Super Motor Oils was the name for their lubricants, and Zip Super Spirit the fuel. Inside is a lengthy table of recommended oils for many motor cars and motor cycle engines of the day. 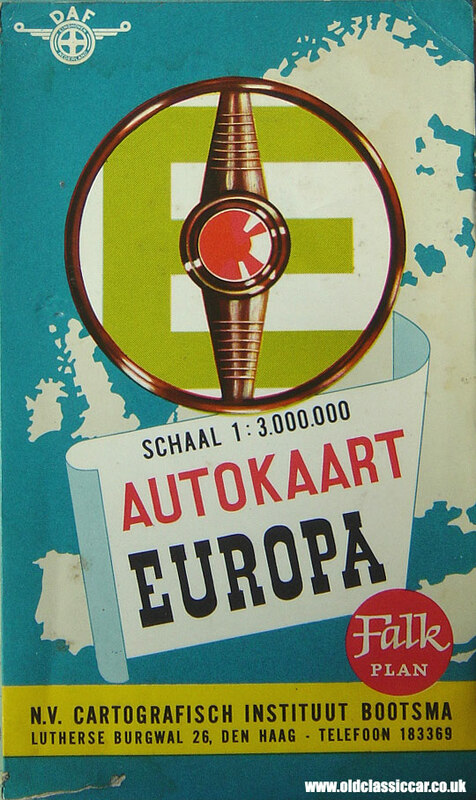 From Holland comes this fold-out map from the Dutch car company DAF, of Eindhoven in the Netherlands. On the rear is an advert for both the DAF 33 car, and also a DAF lorry with a large box trailer on the back. This was printed in 1963. 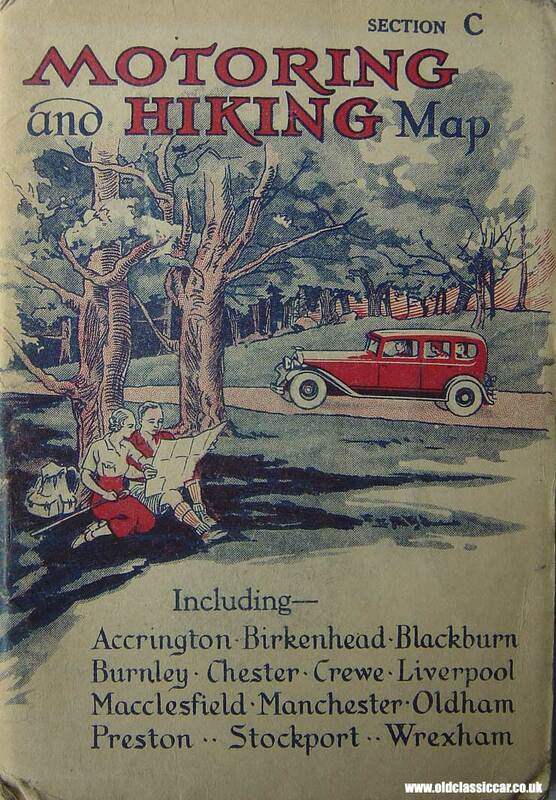 Motoring & Hiking Map. Several of these maps were produced, each covering a particular area. This one covered the Cheshire, Manchester and Lancashire area. The cover features some nice artwork, showing both a motor-car rumbling by, plus hikers taking a breather, reading their map. Esso Road Map No.1 London. Esso produced many many different maps for locations across the United Kingdom, and this one is for the capital. I'd guess it dates to around 1960. NRMA Sydney & District Map. Here's a fab illustration on the cover of this map of Sydney in Australia. It was printed for NRMA - Hugh tells me this stands for 'National Roads and Motorists Association', although despite its name actually operates just in New South Wales. He thinks the car may be loosely based on a Nash Rambler. Daily Mail Motor Road Map of London. This particular map is printed on heavy paper, and combines both a streetmap of London, and also a broader map of the South East corner of England. It dates to the late 1940s or early 1950s. Esso Map of the Caribbean with the Bahamas and Bermuda. As well as for the UK, Esso also supplied maps for overseas locations, in this case the Caribbean. It was issued by Esso Standard Oil S.A. and shows a couple roaring up a hill in their Austin-Healey. There is a lovely illustration on the rear, showing an Esso petrol station attendant about to top up the tank on a 50s sedan. Printed in 1956. 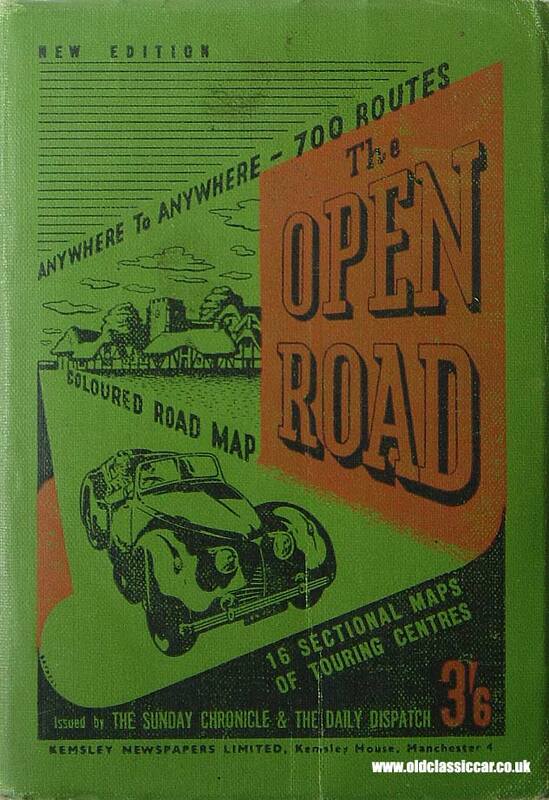 From the thirties is this handy pocket-size book containing maps covering all of the UK. On the cover is a nicely drawn touring car. It was originally dispatched by The Sunday Chronicle and The Daily Dispatch newspapers. The Austin Magazine. 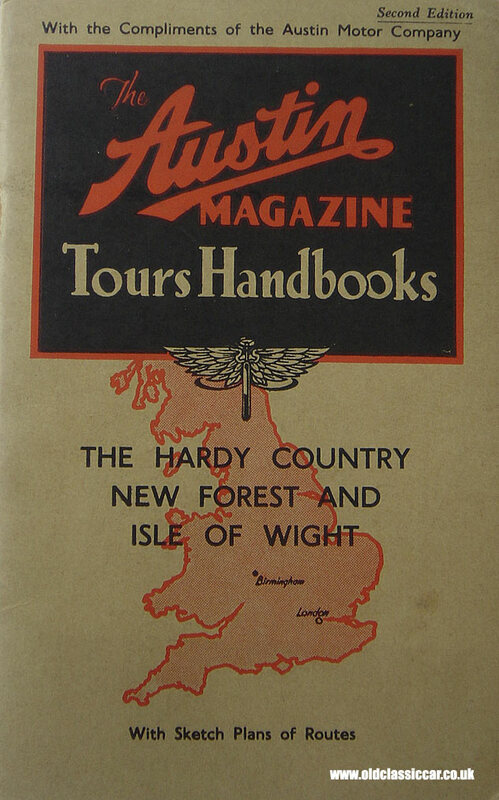 These compact 'magazines', or tour handbooks, were issued by the Austin Motor Company. The content is predominantly route information with just the occasional small map within. I've got several of these covering a number of areas, this one is for the Hardy Country, New Forest and the Isle of Wight. Alberta & British Columbia Road Map. This cracking little roadmap was issued by the British American Oil Company, I should think it dates to the 1930s or 1940s. The cover shows both cars and an aircraft (a Douglas DC2 or DC3), with an advertisement on the back for their '100% Pure Pennsylvania' Pennzoil oils. Delta Route Map. Ok not a road map, but this time a route map. However I really like the illustration so I featured it here, and it shows a pair of Delta Airlines Douglas DC-8 Fanjet airliners, or perhaps they are Convair 880 jets as they get a mention inside. Sadly the condition isn't too brilliant. 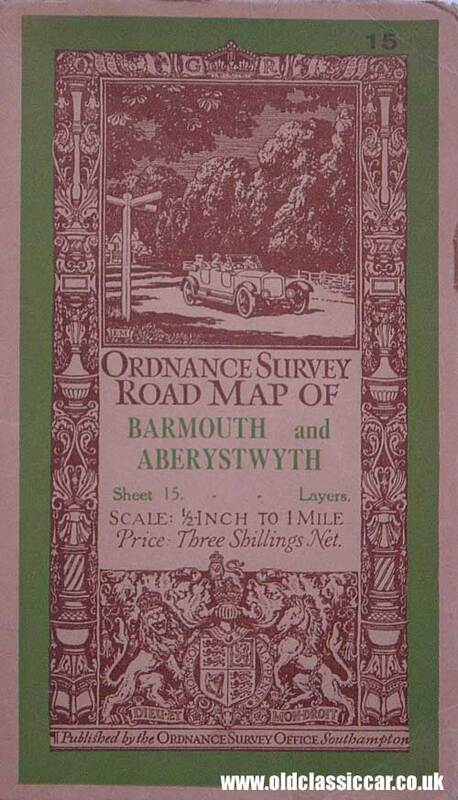 Road Map of Barmouth and Aberystwyth. I bought a pile of these old maps recently, and have shown one of them here. Judging by the motor-car shown on the cover, I'd guess it was printed in the 1930s. These maps were used in the 60s by an amateur rally driver, I was told by the vendor. Tourgide Map of New York and New Jersey. Here is another Tourgide map, issued by the Gulf Oil Corporation. It was printed in 1964, and has an illustration of a gas station and cars on the cover. Other items of interest can be seen in the Motoring Collectables section, including a leaflet from 1927 describing the various maps on offer by Bartholomew's. An alternative to using maps in the olden days, was to make use of a free route planning service, as offered by the likes of the AA, RAC and Michelin. This page looks at a neat, paper-based, distance calculator from the 1950s that presents the mileages between town and cities across Britain, while its 1920s equivalent can be found here. www.roadmaps.org Road Map Collectors Association. More maps 1 More road maps in the US. More maps 2 Another collection of interesting maps.